Late lessons from early warnings is about the gathering of information on the hazards of human economic activities and its use in taking action to better protect both the environment and the health of the species and ecosystems that are dependent on it, and then living with the consequences. The report is based on case studies. 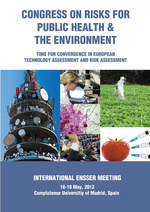 The authors of the case studies, all experts in their particular field of environmental, occupational and consumer hazards, were asked to identify the dates of early warnings, to analyse how this information was used, or not used, in reducing hazards, and to describe the resulting costs, benefits and lessons for the future.